Inhibits blanket weed, flocculates particle matter, increases water clarity, degrades sludge. 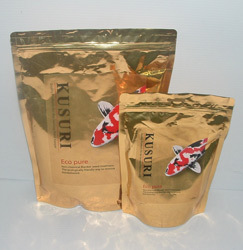 Eco-Pure added weekly will reduce blanket weed by dramatically reducing its food source. Bacteria coat the Blanket weed starving it of food, which will initially break up in to long strands. In some ponds Eco-Pure can work as quickly as 2 weeks, most ponds can take 4-8 weeks. DOSE RATE - Use cup (approx. 25g) supplied, add two cups per 1000 gallons of pond water. For heavy blanket weed growth use up to 8 cups per 1000 gallons.